Tcl/Tk의 유용한 툴에 대해 다룹니다. MyTcl은 www.tcltk.co.kr 이나 http://mytcl.tcltk.co.kr/ 에서 다운로드 받을 수 있습니다. 설치과정에서 특별히 설명할 것이 없으니 넘어갑니다. 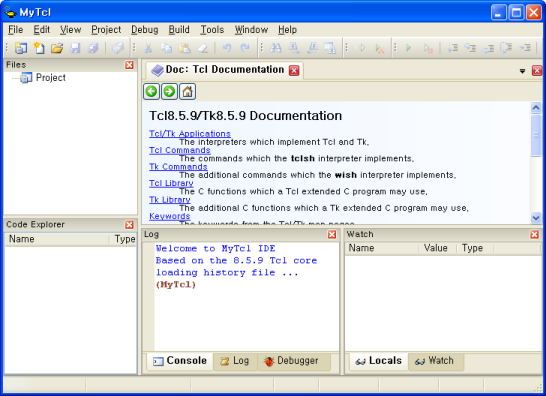 RamDebugger is a graphical debugger for the scripting lenguage Tcl-TK. With RamDebugger, it is possible to make Local Debugging, where the debugger starts the program to be debugged. and Remote debugging, where the program to debug is already started and RamDebugger connects to it.